I hate wearing dhotis (A white wrap around clothing for men in India). But I had no other choice when I did my MBA in Kerala. The college was a cool place to study in. (Rajagiri School of Management) . The professors were brilliant. The Dudes and Babes in the college were classy. We had to wear formal dress to classes. During festival season (Onam, Diwali, Holi) we had to wear dhoti to college. I am comfortable wearing three-fourths or pants; but I was always scared of wearing a dhoti because of the fear that it would fall anytime. 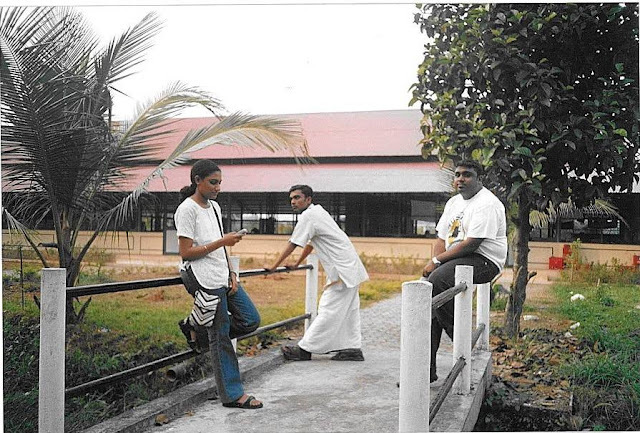 The above picture is taken in our college bridge along with my classmates Nando and D'Cruz. Wearing a dhoti is very easy. All you have to do is wrap it around your waist, the same way you wrap a towel around your waist after a bath. 2) Underneath the dhoti, you should always wear an underwear. A pattapatti underwear would be the best combination. Even if you don't have one, make sure that you wear a boxer underneath. Please wash the underwear and wear it. 3) Walk as if you have piles. Don't take long strides. For every long stride that you make, the chances of the dhoti loosening is more. 4) When you fold your dhoti make sure that you fold it only till your knees. Don't reveal too much of your thighs. 5) Wearing a dhoti gives you the same feeling that a saree or a skirt gives to a girl. An unforgettable incident happened when I wore the dhoti for the first time in my life. I had already spoken about it long time ago. I am gonna write it again here because it would be a perfect end for this post. It happened in the year 2004. Both these things happened on the same day. The day started as usual...The alarm started its daily routine of trying to wake me up at 8 am..As usual my hand had enough strength to reach for the snooze Button and calm it down...I snoozed my way back into my dirty bedsheet... The alarm rang again at 8.15 am...My hand again came out of the bedsheet and searched for the alarm clock. But I could not find it.My MBA roomie( Joseph) moved it to a place which was out of reach. The day was finally over; it was around three pm and I started my long walk back to the place where I stayed..(It was a long uphill road from the college).. The sun was beaming full of confidence..Suddenly my hip and the belt had a bi-lateral conflict and beforeI realised, I was walking without the mundu.. I was releived because I had a long kurta top.. I turned around and to my horror saw a bunch of senior babes walking behind me..What can i do? I closed my eyes and ran inside my room... I heard them giggle as they crossed my room and the giggles erupted into laughter when they saw me peeping out of the window... Wisdom struck me at the right time.. Our national leaders have gone through sufferings worser than this and what happened to me then was not a big deal..
Did you find later where the mundu went? :P And you took it in your stride... quite literally too! haha! good one! Seriously i have never understood why anyone wants to wear that thing. In north they wear doti in totally awkward position and in south it's just wrapped around the waist. What the hell is with that? I have mallu friends who wear three fourths below the mundu. Are you wearing socks in that photo?! I'm damn sure in the photo, what you are thinking!